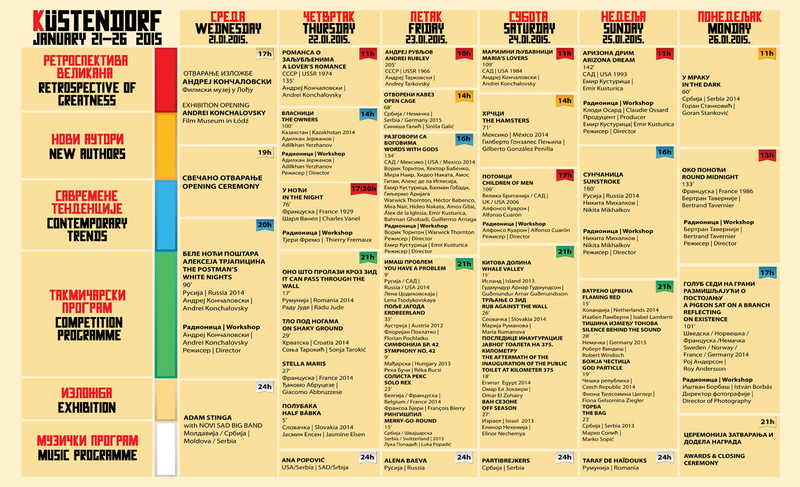 Kustendorf Film and Music Festival - The Eighth Küstendorf International Film and Music Festival will be held on 21-26 January 2015 in Drvengrad in Mokra Gora. The festival is organized by Rasta International, under the auspices of the Ministry of Culture and Information of the Republic of Serbia, The Town of Mećavnik and TNSO. As in the previous years, the festival will be dedicated to the future filmmakers and giants of contemporary auteur film.